1. Pay no attention to the guys in the boardroom chairs waiting for their next tax loophole: With his corporate welfare buddies, Christie’s in a shaky position to lecture anybody on entitlements. 2. Thanks Gov, but you killed my job: Some of the workers Christie paints as lazy would have good jobs right now if he hadn’t pulled the plug on the ARC Tunnel, a public works project with documented need, the cost of which independent congressional investigators now find (surprise!) Christie exaggerated as he was building his national rep.
3. Really? You said this at a George W. Bush ‘conservative conference’ Conservative? Let’s see. Doubled federal spending inside of 8 years. Privatized war (including the one based on a WMD lie) to the tune of billions and billions of our money to his buddies. TARP bank bailout requiring little if any responsibility back to the public. 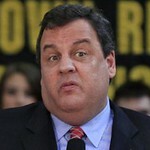 Whatever Christie says to a gathering of people still impressed by George W. Bush should be held in contempt. Neither Ledger’s Megan DeMarco, who wrote the story under the headline or the desk editors who probably supplied it used it to mislead the readers about what Gov. Christie said. THAT’s what makes this so alarming. …I really need to double up on my blood pressure meds on days like this. Oh. I forgot – I can’t afford them any more I’m so freakin’ poor! Somebody needs to take a figurative electoral ‘baseball bat’ to this numbnutz-helicopter-jockeying-ALEC-loving-jerk. I want MY New Jersey back! and calls you a loser because your’e not out working. and calls your kids losers because they’re not college-ready. and wants to know why you can’t get to work on time. resulted from government related work as a lobbyist in Trenton. If one is looking to be technical about the ethics of receiving government generated personal income Christie is not so pure. The other aspect of the comment is related to a perception of laziness among those that are unemployed. If that sentiment were correct then the financial crisis of 2007-08 would have been irrelevant because people would already be trying to collect unemployment and other government benefits at those levels. That was not the case, rather, unemployment benefits correlate best with a lack of demand for work and rise and fall with the demands of the labor market. Even further, one of the largest groups of the unemployed after the crisis were construction workers – is this a result of sudden sloth or, as the evidence would suggest, the result of a severe downturn in the housing market and therefore a lack of demand for new home construction? All available evidence thoroughly suggests the latter. In short, Governor Christie’s statement is both hypocritical and inaccurate. Can someone explain this one to me? It seems to be the plan was to make it easier for many thousands of jobs to leave NJ for NY. The sort of jobs that fill the glass cubes on Rt. 80 that are empty now. The sort of buildings and business that raise taxes to the state. The jobs that drive our income tax revenue, drive down our property taxes, revitalizw our cities, and lead to more infrastructure jobs — permanent jobs, not diggers. We all know people who quit Manhattan’s commuter rat race, came back to New Jersey, and couldn’t be happier. Why was this ever even considered?